Place hoisin sauce and 2 tablespoons cold water in a medium bowl. Add chicken. Toss to coat. Heat a large frying pan over a medium-high heat. Cook chicken, pouring over any remaining marinade, for 4-5 minutes each side or until cooked through. Meanwhile, place noodles in a small heatproof bowl. Cover with boiling water. Stand for 5 minutes or until noodles are tender. Separate noodles with a fork. Drain. Refresh under cold water. Combine noodles, 2/3 of the onions, and the remaining ingredients in a large bowl. Toss to combine. Serve chicken with sesame coleslaw and sprinkle with the remaining onion. Note: swap chicken with pork loin steaks or fillet if you prefer. Healthy pork burgers with lots of added veggies. 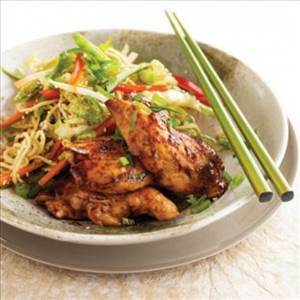 There are 272 calories in 1 serving of Sticky Hoisin Chicken with Sesame Noodle Coleslaw. Calorie Breakdown: 23% fat, 38% carbs, 39% prot.